You might be getting out of your home just as the roof needs to be replaced. You can certainly leave that for the next owner but expect to have some money knocked off your asking price to facilitate that task. A new roof would be considered a major repair. There are probable a lot of minor repairs you could take on with very little effort or cost. These will help when an inspector comes through. Every fix counts. Your front yard is going to be the first thing a potential buyer is going to notice. What is your front yard saying about the rest of the house? If there are dying plants, grimy siding and a lawn in need of mowing, then you can imagine what a buyer might think about the inside of your home. Fresh flowers and a power washer can work wonders around the front of the house. Your broker might suggest staging your home. Staging is where a professional will come through and literally decorate your home with new furniture and décor touches. This is great if you’ve already moved out. If you haven’t then all of your things might have to go into storage for the duration of the open house season. Whether you’re staging or not, you’ll definitely want to get rid of all the rubbish. First, this is something you’ll want to do before you move. 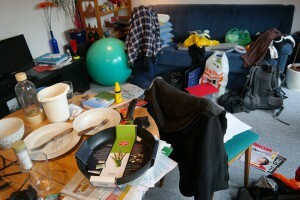 You certainly don’t want to bring any of that clutter with you to your new home. This is where Junk Works can be a big help. One session with Junk Works is all it will take to clear out all you unwanted furniture, appliances and other household goods. That is going to impress a buyer for sure. Free up storage space and get your home ready to sell with some rubbish clearing help from Junk Works. This entry was posted in Cleaning Tips and tagged home, junk works, rubbish on February 28, 2018 by Junk King. Last updated March 2, 2018 .